When we started the rehearsal process for The Farnsworth Invention, it was still winter, if only the last stretch of it. Now, when we go to the theatre for our nightly performances, the weather is stunning. Some of the cast - those with time on their hands - spend the afternoon out in the sun, working on their tans and trying to fill the time between finishing college classes and heading off to their summer jobs. "When it rains it pours," my character says to Betty in the closing scene of act one. It has felt like that in my real life in recent weeks as work and community priorities, combined with the rigors of doing this play, have left me little time to enjoy the changing of the seasons. That will come to an end on Sunday after we close the show. There is a fishing pole calling my name out in the garage. 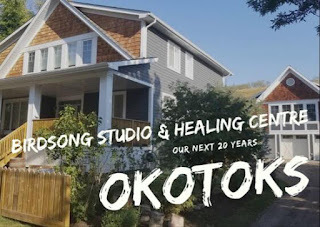 As we perform the closing note on what has been a great season for the Keyano Theatre Company, many eyes are looking ahead to the season ahead. 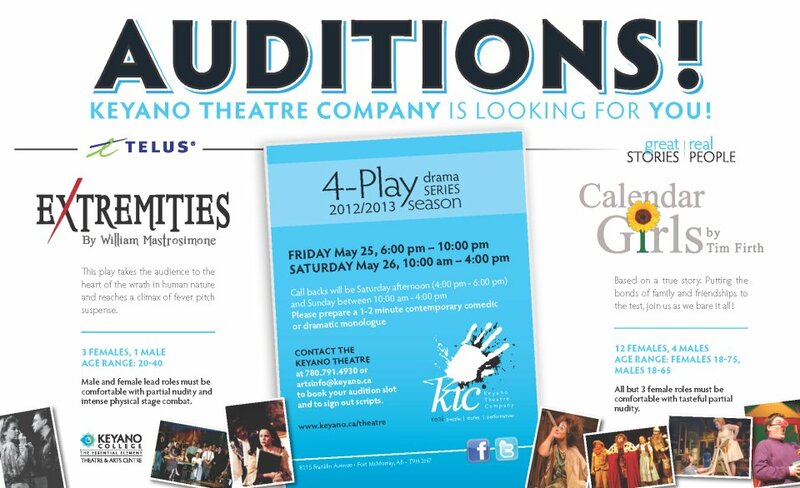 There are two sets of auditions coming up in three weeks. A good friend from the current Leadership Wood Buffalo class is over the moon excited about trying out for Extremities by William Mastrosimone. 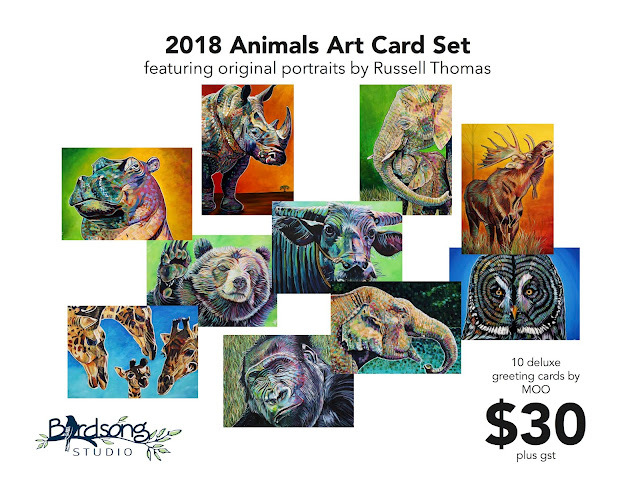 Directed by a former colleague and artistic director of Keyano Theatre, Paul Gelineau, this show will require equal measures of physical and emotional commitment. It's going to be an amazing ride. Concurrent auditions are also taking place for Calendar Girls by Tim Firth. There is a lot of buzz about this one, as names are coming out of the woodwork expressing an interest in this play made enormously famous by the film of the same name starring Helen Mirren. Valmai Goggin (Chicago) returns to direct this delightful and delicious romp through a very revealing and heartfelt story. 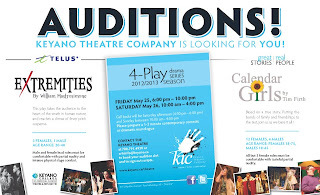 If you're interested in finding out more about auditioning, you can contact Keyano Theatre Company in one of two ways: by phone at 780-791-4930 or by email at artsinfo@keyano.ca. Claude Giroux (artistic director) and Michael Beamish (Mr. Farnsworth) are hard at work gathering stories and conceptualizing Hometown the Musical, a 100% locally-created show by and about us! If you're interested in sharing stories or ideas, connect with the development process through their Facebook page located here. It was a special show for me last night as my family was out in the audience. Heather and her friend Twyla were sitting out there in the dark with Dylan and Ben. Gary and Helen were also out there and several other friends who had tipped me off that they were coming. 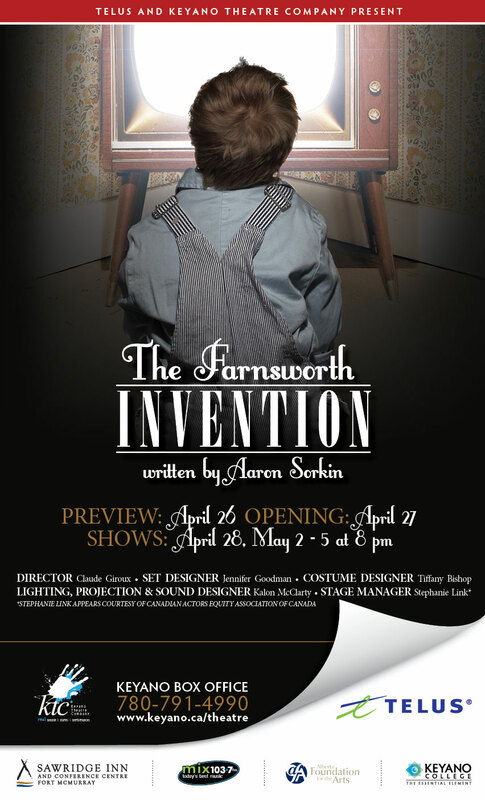 I appreciate the support of each and every one who has come out to see The Farnsworth Invention, both friends and strangers. I especially appreciate those folks that I don't know who have been so gracious to introduce themselves out in the community and share their effusive thoughts on the production. Nothing makes me happier than when someone gathers up their courage to say hello and share thoughts and ideas, whether that is someone who sees a play or wants to talk about a municipal government issue. So keep the comments coming! We appreciate your enthusiasm, interest and your support of live theatre.